"This is my newest sequined shirt. My daughter has made me about twenty of them. This one is over the top," the gentleman in front of me says. His black shirt with pearl snaps is embellished with jewels and sequins in v-shaped formation on the collar and straight down the placket, with orange flame trim curving out from there. A burnt orange scarf is tied Roy Rogers-style around his neck. The finishing touch is a Silver Belly 50X cowboy hat that hides the gray hair of the seventy-eight-years-young James White, owner of the Broken Spoke in Austin, Texas. The Broken Spoke has earned the title of the Last True Dance Hall in Texas, with live bands playing country music on stage five nights a week. And it all began over fifty years ago, when a much younger White had a vision of the dance hall that would become the stuff of legend. White was still in the army when he had the idea to open a dance hall in Austin. He wanted a place that felt like the dance halls he went to when he was growing up. “I started thinking of names. There was an old movie called Broken Arrow, and I had this image of wagon wheels. I thought I’d get me a couple wagon wheels, knock a spoke out, and I’ll call it the Broken Spoke,” explains White. “The name lit up my brain, and it stuck. We’re the original Broken Spoke, though people have copied it over the years.” White initially felt some resentment toward the imitators and consulted his buddy Willie Nelson, who advised him to take it as a form of flattery and go on with it. That was good enough for White. After White returned from the army in 1964, he stood on this property along South Lamar Boulevard, then an empty piece of land with an oak tree out front, and knew it was the right spot for his dance hall. He was twenty-five years old and not afraid of getting his hands dirty, nor was his now wife, Annetta, who agreed to go along with his big plans. This undertaking was truly a community effort. As White explains, “I had everyone in Austin helping me build the Broken Spoke. We had no levels or squares, so it’s a little off-kilter, but these people were my customers. I helped a carpenter for a few summers, so I knew a little. I don’t think the carpenter even had a level. He would eyeball it and say ‘Nail it!’” The joint isn’t short on character—framed photos of country stars line the walls, and a special room right off the bar area is filled with more photos and memorabilia, including half-smoked cigars and guitars from famous musicians who have played their way to fame. The ceiling in the dance hall is so low that some musicians on stage have to remove their cowboy hats to play (which Garth Brooks did when he held a surprise concert at the Broken Spoke). I watched a fiddle player anxiously, wondering if his bow would take out a chunk of drywall. The dance floor is concrete, and basic homemade wooden tables flank either side, with gingham tablecloths as backdrops to plates of their famous chicken-fried steak. Unfussy furnishings, reasonably priced food and drink, and true country music keep this place happily humming, as does Ginny, White’s youngest daughter. When asked to reveal his secret to success, White laughs and answers, “I used to tell people, ‘Well, there ain’t nothing to being successful—you just work about sixteen hours a day, and after about thirty years, it all just falls into your lap.’" Joking aside, White and his wife did work incredibly long hours for the first two years, booking bands seven nights a week. There was no dance floor when they first opened, so patrons would dance out the front door and spill out onto the dirt parking lot, and then turn around and dance back in. Some of the band members had families, and you could sometimes find children napping on top of and underneath the pool tables. In 1967, White began booking Willie Nelson for $800 a night. In those days, Nelson was clean-shaven with short hair and often wore a sports coat. George Strait was another fixture at the Broken Spoke until he hit it big in Nashville. Before he went up to Tennessee to record “Unwound,” he was making $400 to $500 a night at the Spoke. From there, it went up to $3,500, and, after he recorded a second song, it went up to $20,000 and $100,000 and White could no longer afford to book him. “He doesn’t come out here singing anymore. We’re still friends, though,” explains White. The clientele is a mixture of quirky regulars and tourists following the advice of the many guidebooks that promote the Broken Spoke. One gentleman in a vest and cowboy hat asked if he could lasso me. White himself encouraged me to participate, calling out, “Shelley, keep your hands in!” I nervously laughed as the lasso was tossed and landed smoothly around my waist. The roping was a success, and nearby guests cheered. And then it came time for White’s nightly speech, where he introduces the band and talks about the Spoke and greets his customers. Each time he makes this speech, one lucky person is nominated to roll a giant old wheel with a broken spoke back and forth in front of the stage. Not one to argue with tradition, I graciously accepted the honor bestowed upon me to balance the somewhat unwieldy wheel, carefully guiding it back and forth across the dance floor as White talked into the microphone. A lovely man named George exclaimed, “Look up! Smile!” as he produced a camera from his pocket and snapped a few photos. After the wheel was safely returned and George had offered a wet paper towel for my hands, White generously introduced me to dancers willing to twirl me around the expansive floor, each with his own personal style of steps and turns. White is opinionated about what dancing styles can be used on his floor. 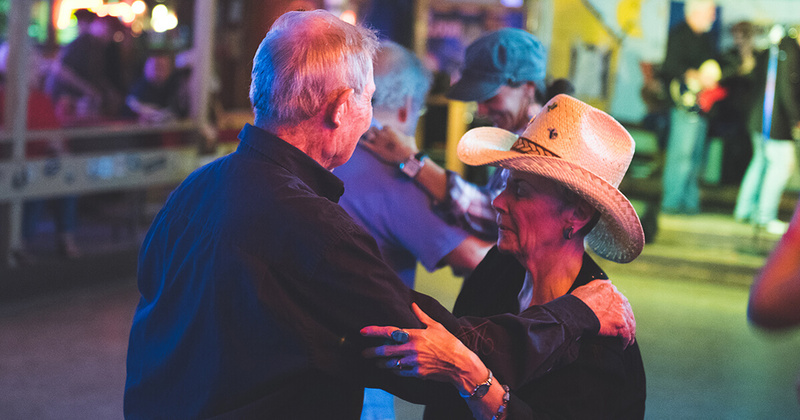 You won’t see line dancing at the Broken Spoke—line dancers and partner dancers rarely get along, as it can be difficult to coordinate space and line of dance on the same dance floor. Partner dances, however, like the Texas two-step, waltzes, polkas, western swing, and the jitterbug, are staples on the floor. White’s eldest daughter, Terri, teaches partner dancing before the band begins. While he may feel some wistfulness about the changing societal landscape, he’s grateful for the success and longevity of his business. When Texas Highways (the travel magazine of Texas) voted the Broken Spoke best honky-tonk in Texas, people flooded in requesting autographs of the magazine cover. He now takes photos with guests just about all night and has been the subject for a book called The Broken Spoke as well as a documentary called Honky Tonk Heaven. He jokes that he pestered the author and producer, warning them he was getting old and wanted to still have eyesight in order to read the book and watch the film. It’s easy to see why White is so beloved. He genuinely cares about people, he takes personal responsibility for their good time, and he hasn’t let fame go to his head. He was a hard worker then, and he’s a hard worker now, working on his ranch during the day and schmoozing people at the dance hall most nights. He may be seventy-eight years old, but White still has the heart of that hopeful twenty-five-year-old with some land and a dream. For more info, visit brokenspokeaustintx.net. Mosey onto social media to share some dance hall nostalgia with family and friends.